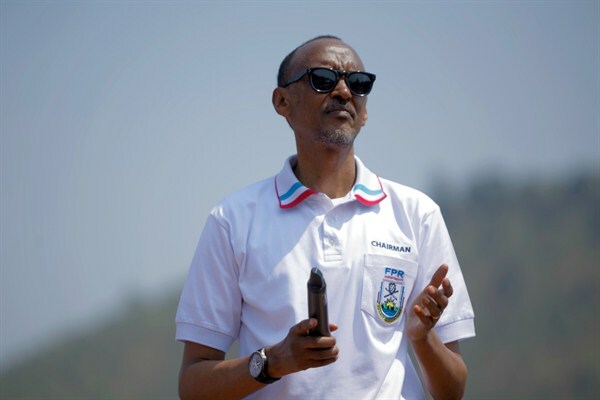 With Kagame Set for Another Re-Election, Can Rwanda’s Stability Survive Him? Rwandan President Paul Kagame addresses supporters at an election campaign rally in the Nyabugogo area of Kigali, July 19, 2017 (AP photo by Eric Murinzi). In May 2016, five months after voters approved changes to Rwanda’s constitution that would allow him to spend up to 17 more years in office, President Paul Kagame sat down for a telling conversation with two of his most high-profile foreign admirers: former British Prime Minister Tony Blair and American philanthropist Howard Buffett.